Over at a friend’s house in our neighborhood, my new BFF plucked a bunch of mint for me that was growing like stink weed in her side yard. I brought the bunch home and stuck it in a mason jar full of water on my kitchen counter. For the next several days I took clippings of the leaves and my water cup had fresh mint in it… ahhhh, so refreshing. Then I noticed tiny black seeds had fallen off the mint leaves onto the counter. I picked one up and squeezed it to see if it broke open and smelled like mint. That baby was rock solid, but DID smell like mint. Remembering my friend’s over-prolific mint plot, I brushed the little seeds into the palm of my hand and traipsed out to the back yard to plant them. We have a pot with basil and oregano volunteers just starting to grow, so I made a little trench on the far side of the pot and planted the mint seeds. Visions of transplanting the mint to a permanent location consumed my mind, well, until the washing machine buzzed and I was called to laundry duty. The next day, lo and behold, there were more little seeds. Then there was a repeat of the brushing and traipsing and planting and envisioning a mint farm in my own oasis. On the third day, I noticed that all the leaves were missing from the tops of the mint sprigs… and more seeds were on the counter….. and there was a very fat, formerly very hungry caterpillar lying dead in my kitchen sink. You guessed it. They were not seeds. They will not grow. I was planting caterpillar poop in the planter on my patio. After squeezing it and smelling it and holding it gingerly in my hand. Ewwwwwwww. Just ewwwwwww. 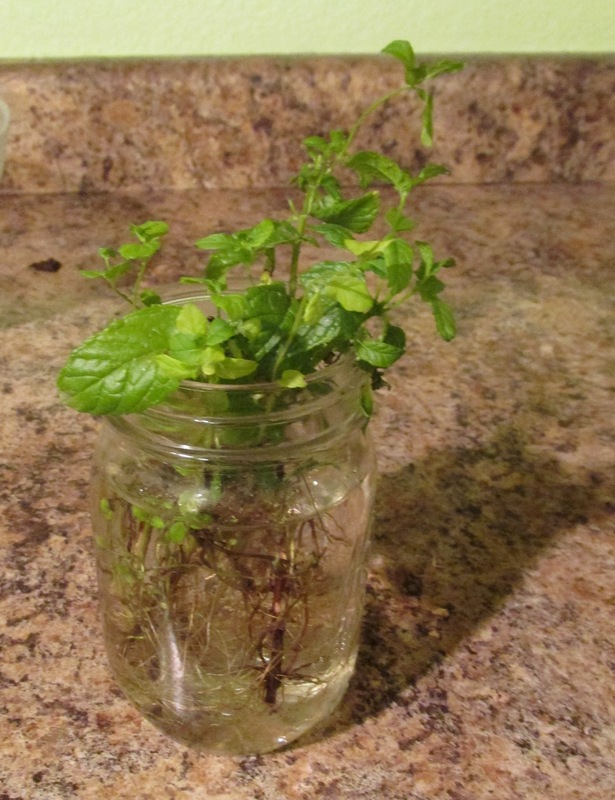 BUT, I trimmed the mint and it has rooted in the jar of water and new leaves have grown in to replace the eaten ones, so I’m still having visions of a mint harvest from lush plants grown in my own backyard…. maybe in the fall. Summer is too hot in Phoenix for anything to survive if I accidentally forget to water even for one day!